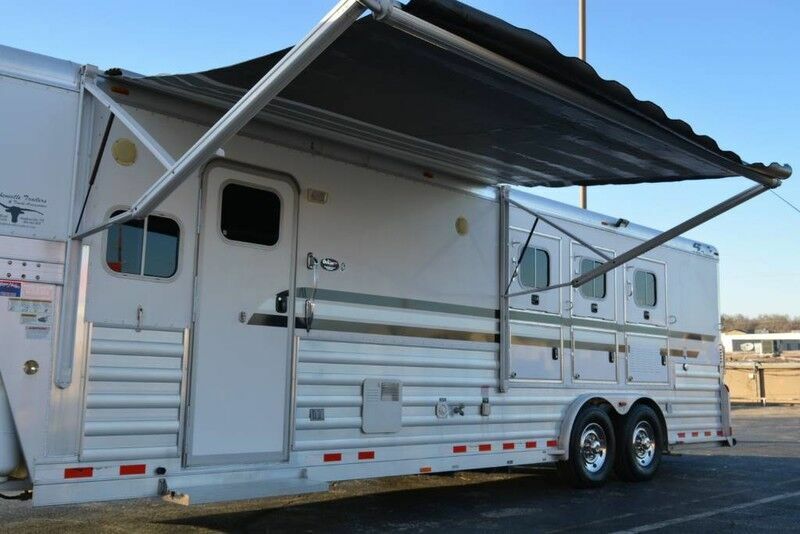 This Beautiful Is 4 Star Outlaw 12 Foot Short Wall 3 Horse Slant Living Quarters Is Incredibly Nice Inside & Out. An Immaculate Well Maintained Trailer That Is Sure To Please Even The Most Discriminating Buyer. This Unit Belongs To One Of The RLB Partners Who Has Used It Very Little But Maintains It To Perfection. It has Been Stored Inside And Has Just Been Serviced. It Is Ready To Take Anywhere. A Totally Rust, Corrosion And Flood Free North Texas Trailer That Will Meet Every Expectation. We Only Sell Top Quality Vehicles. I Will Personally Respond To Every Email Or Text Message. Conversion Was Done By Outlaw. Features Include: Bed, Sofa/Sleeper, Refrigerator/Freezer, Microwave, Television, Chair, Air Conditioning/Heating, 2 Sinks, Shower, Toilet, Stud Wall, Awning, Generator, And Much More. Your Satisfaction Is My Goal Every Day. You Can Buy This One With Complete And Total Confidence.